Energy matters. So does being different. Without either, things get kind of boring. 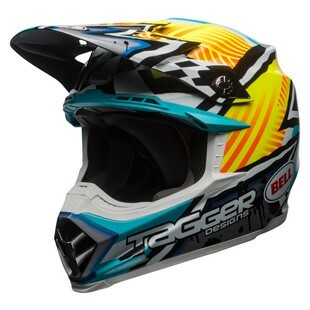 Good thing for dirt riders, the Bell Moto-9 MIPS Tagger Assymetric Helmet exists. First off, that is not a typo. This lid is called the “Assymetric.” True story. Moving on from that tidbit, the point here is that Bell has crafted a wacky, high-energy, instant eye-grabbing lid for serious dirt riders. From the lightweight composite Tri-Matrix outer shell to the super-attention-to-detail aerodynamics that went into its development, the Moto-9 is a stand out option in the motocross world. Additionally, the inclusion of MIPS technology works to provide some of the most well-researched motorcycle helmet defensive features out there. It’s a baller combination. Regardless of if you’re interested in the Moto-9 MIPS Tagger Assymetric Helmet for the features, finish, or freshness of name, you won’t be wrong.